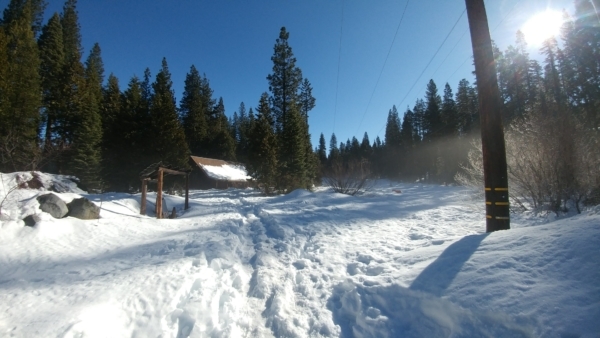 Winter Camp is an electronic free weekend in a wonderful cabin in the mountains near Tahoe. There are enough bunk beds for 40 people. The weekend generally involves hot chocolate, snowball fights, fort building, board games, puzzles, and reading. There are no formal activities, just hanging out in a winter wonderland. There is a full kitchen, large fireplace, two flush toilets. We are responsible for meals and cleanup. There is parking is close to the cabin, but be forewarned you may need to walk a couple hundred feet over an icy path. On Hwy 80, after crossing Emigrant Gap, go about 5 miles past the Nyack Shell Station. Take the CA-20 turn-off, proceed less than 1 mile. The turn-off is to the right, not the building close to the street, but the next driveway. It is not well marked –there is a red metal gate that will be open. The road in is paved and will be plowed. Park in the main parking and the Ibach Lodge is straight ahead.